So you’re organising a conference? Organising a conference can be a nightmare, but it need not be. But once the organiser has gone to all the trouble of putting the event together it’s time to think big! Q, Why go to all the hard work and not take your conference to wider audience? A, By professionally webcasting streaming your conference with Live Video and Audio to internet viewers you have a great opportunity reach interested and targeted parties. Think about the possibilities? Q, Why not digitally interact with attendees? A, These-days it is well known almost everyone has a smartphone. Why not interact at your conference with attendees and webcast viewers Live via Twitter? We see it all the time on the ABC’s TV show Q and A and the best part it is dead simple to do. Advertise your Twitter handle at the venue and include an interactive Twitter feed in your webcast page. It will provide your conference speakers and audience a wonderful opportunity to interact. If you have doubts designate a moderator to filter questions. Q, Why have Webtron professionally webcast your next conference? Because we have the track record! Our clients trust Webtron to ensure their webcast will run smoothly. We prepare, consult, test and double test. We have never let our clients down. Q, What does a professional webcast cost? Well, that depends on many factors. Try not to think of it as a cost but an investment. 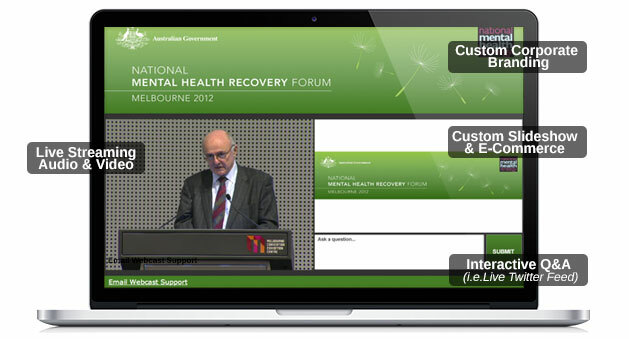 Webcast viewers love to watch streaming audio and video with synchronised PowerPoint slides events online. Some of our clients can even make it a self-funding. For example, can you add sponsors names and links to the webcast? Or perhaps consider charging webcast viewers? Whatever the case providing online access to your conference or events via a webcast will provide a great return on investment.